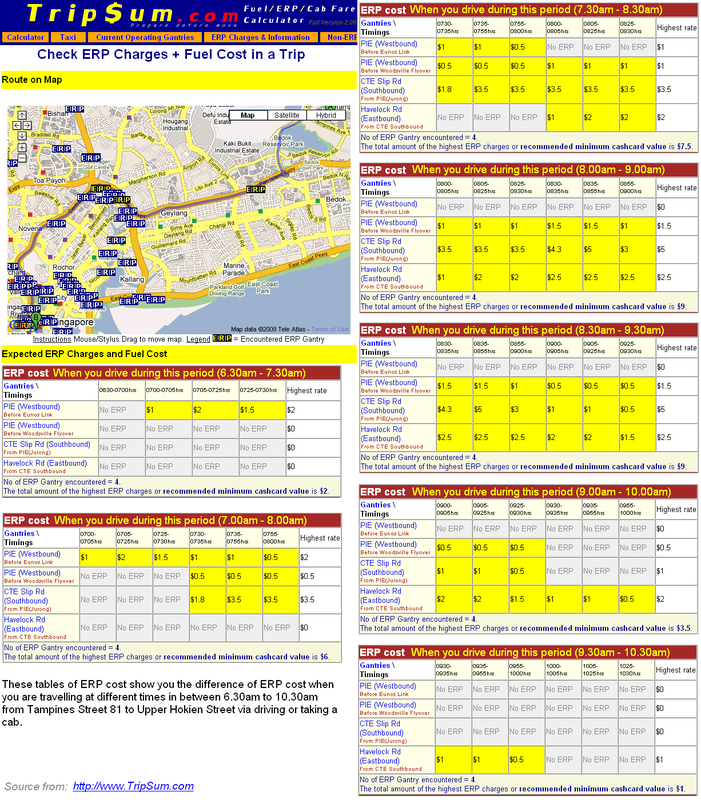 TripSum.com -> Your trip's sum calculator for Fuel, ERP and Taxi Fares in Singapore! OPC $20 coupons usage will be ceased on 23 November 2009 which will be replaced by the new E-Day License.View here for more information. Logon to TripSum.com->Click the (+) button at the bottom of iPhone->Choose (Add to Home Screen)->Name it as "ERP"
This feature helps anyone to know which ERP is on/operational at certain timeframe and day. Comfort Delgro will scrap the 30cents Fuel Surcharge from 12th Nov 2008 onwards, thumbs up to Comfort/City/YellowTop Cabs! Transcab will scrap the 30cents Fuel Surcharge from 11th Nov 2008 onwards, thumbs up to TransCab! Outer Ring Road Flyover Road (from Lornie Road->Bradell Rd) and (from Bradell Road->Lornie Rd) have opened. Good news for Motorist who are accessing or coming from Hougang, Serangoon, Paya Lebar will benefit from this if they are going/ coming from PIE / Bukit Timah / Queenstown or AYE. Implementing of 30cents (S$0.30) Fuel Surcharges on top of the flat fare in Taxi fare on 17 July 2008, It may affect the regular cab passengers at an increased of $13.20 a month if he/she take cab thru and flow to work. It is very useful to print out and keep this in your vehicle for reference. Extension of CBD ERP(excl Orchard) ending timing to 8pm from 7July onwards. 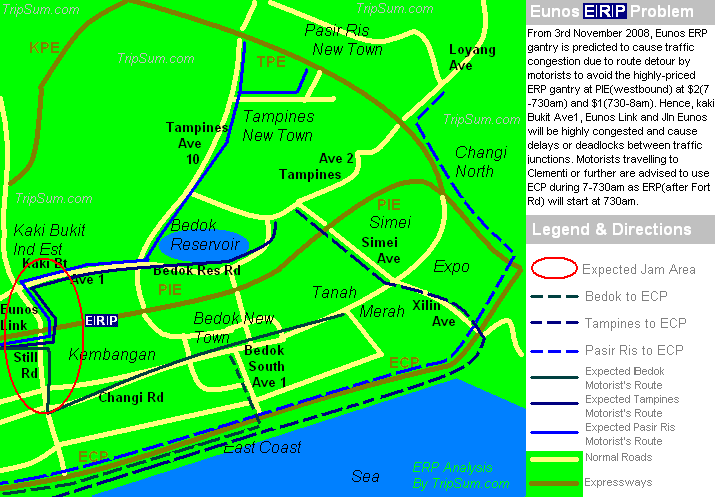 Extension of CBD ERP(Orchard) starting timing from 11am on Saturdays from 7July onwards. (Lowered Down) 24May-21Jun School Holidays ERP rates updated. System Ready for Orchard cordon increasing rates. 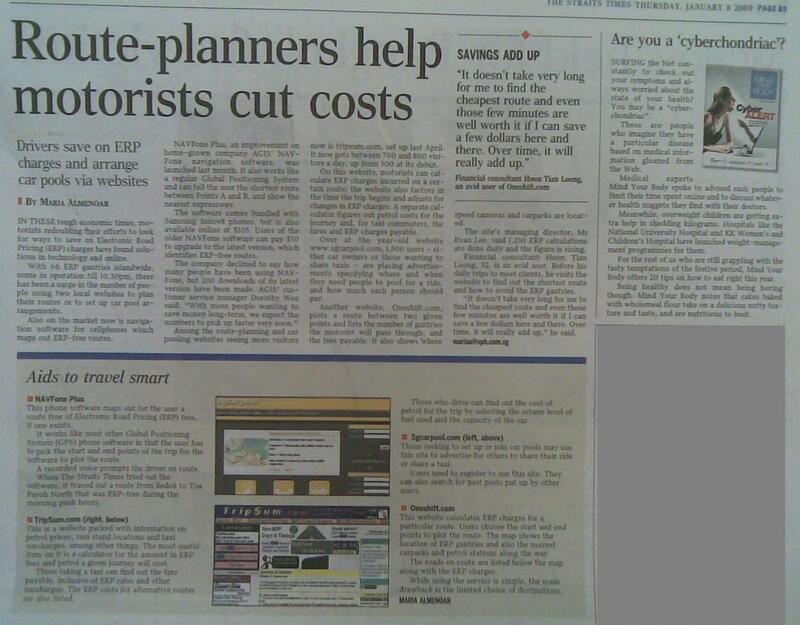 System Ready for Singapore River Line ERP from 1st July. Eve/ Major Holiday Displaying for Taxi Fare Bug Fixed. Normal Public Holiday(No Surcharges) and Major Holiday Surcharges for Taxi Fare Bug Fixed. Distance Tuning accuracy at 90% has achieved. Beta Version upgraded to version 0.23. Beta Version improved to 0.62. CarPool and CabSharing Features from PassingRide Added as Saving Gaia Purpose. Full Version 1.01 expected to be ready on 1st July.